— Gyroidal torsion flute and wide land construction yields exceptional performance in deep hole drilling. — Allows deep hole drilling without drill retraction. — Titanium nitride coating for lubricity, abrasion resistance extended tool life. — ﻿Recommended for a wide range of steels, castings and other hard metal drilling application. of chip formation. Larger helix angles provide effective removal of soft, long-chipping materials. Smaller helix angles, on the other hand, are used for hard, short-chipping materials. 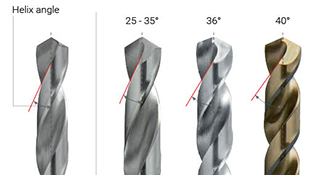 Twist drills that have a very small helix angle (10° - 19°) have a lengthy spiral. In return, twist drills with a large helix angle (27° - 45°) have a rammed (short) spiral. Twist drills with a normal spiral have a helix angle of 19° - 40°.